This is Part 2 of a series of three articles. Part 1, The Domestic Dispute Returns, may be found here. There’s nothing quite like the orchestral horn. It is Beethoven’s thunder and Tchaikovsky’s soul (Symphonies No. 5); Brahms’ clarion call (Symphony No.1) and both Strauss’ prankster and hero triumphant (Till Eulenspiegel and Ein Heldenleben). It’s also hell to play. The reason is simple: like all wind instruments, it’s just a tube – a very elegant, photogenic tube – that vibrates along the harmonic series. Unlike most other wind instruments, however, the core of the range lies in the upper half of the harmonic series, meaning the naturally occurring pitches are much closer together than on a trumpet, which has the advantage of playing towards the bottom of the series where the pitches are further apart. The consequence? It’s much easier to play wrong notes on a horn. A reason isn’t an excuse, however, as my students will ruefully remember: they could have chosen triangle instead. And so for the next three years, in parallel with my piano studies, I did solitary battle with this most recalcitrant and unforgiving of instruments. At the age of 16 I dispensed with piano, after a passable (literally, and barely at that) music examination in which I “got through” the repertoire, and devoted my attention to horn. I had successfully surmounted the audition barrier first into selective wind ensembles, then into the local youth orchestra. The wind ensemble experience was notable only for the social element, but in orchestra at least I could enjoy the repertoire. Throughout all this, I still hadn’t reached the point where I was convinced I wanted to be a musician. I enjoyed mathematics and physics too, and in high school completed the top-level requirements for entry into engineering at a much respected university, while not bothering with any of the prerequisites for entry into music. As it turned out, I was ultimately steered into music, but it would take another year – more specifically, an unremarkable year in one youth orchestra and a life-altering three weeks as principal horn of another … on an extended tour of Europe. 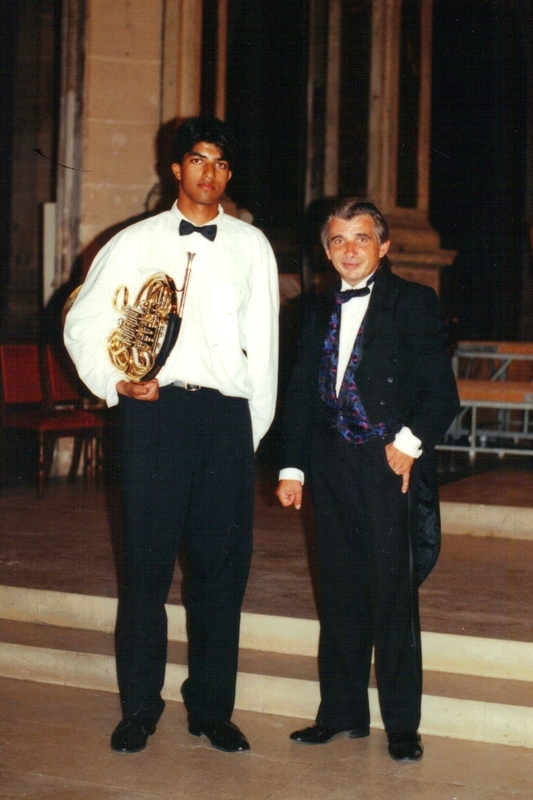 With Stan Kopac, conductor of Niagara Youth Orchestra, in St. Severin, Paris France. Until that trip, I had associated youth orchestra performances with inadequately prepared programs presented in half-filled, low-grade venues. And although the beautiful European halls filled to capacity were extremely gratifying, the part of the experience that has stayed with me the longest was the opportunity to engage with the music on a completely different level, to go beyond playing it to a place where I started to understand it, to appreciate its architecture and narrative experientially, even if I lacked the knowledge to deconstruct it theoretically. The difference was no more than frequency and repetition, but music had finally begun to mean something more to me. I passed the entry audition as a horn player for the Bachelor of Music program and spent the better part of the next decade (with some extraordinary digressions) in various levels of academia, ending up with a Doctorate in Orchestral Conducting, working with conductors like Kurt Masur and Marin Alsop in the process. None of that time bears much mention: it wasn’t really education, it was simply credentialing for a schooled society. There were two exceptions. The first was my two years at the University of Victoria, where I completed my undergraduate; I discovered I could love rehearsals too, when they were led by a conductor and artist of consummate ability. The second was my eventual return to piano during my Masters degree in conducting, over a decade after abandoning the instrument. Circumstances were a little unusual. My girlfriend at the time (now wife) was preparing a piano recital which included a Mozart concerto. Out of a desire to win favour (we were still at that stage, or rather, I was) I volunteered to perform the accompaniment during her repertoire class. Maybe it was Mozart, perhaps it was making music with a person who was already consuming the entirety of my affection, but it was the first time I can recall enjoying the experience of playing the instrument. I was sufficiently motivated by the process to ask the head of the piano department, Theodor Lichtmann, if he would consider giving me a semester of lessons. For reasons I cannot fathom, and based solely on that one public performance of an accompaniment, he very readily consented. I was about to come full circle. ← The Domestic Dispute returns! I just finished reading your last 2 posts and had to chuckle. They brought back lots of memories including you insisting that you wanted to play Beethoven’s Moonlight Sonata when Shelagh Scott said your hands were too small but you insisted and you did play it. Can’t every remember having to encourage you to practice. I also recall that you willingly gave up going skiing in Lake Louise in order to stay home and practice your horn. You have come a long way and it is all your doing. Dad and I were just the cheerleaders.